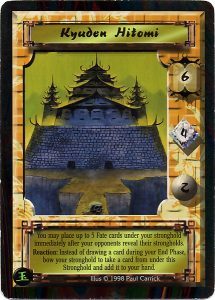 Welcome to the first of an ongoing retrospective series about the Legend of the Five Rings CCG from Alderac Entertainment Group where I select and discuss a particular set of pieces with respect to their characters, structures, and/or actions. Whenever possible, I consulted with those involved in the creation of these artworks about their given direction or personal vision. 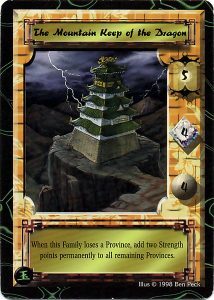 This first article revisits the Dragon clan and the earliest iterations of their strongholds through the Jade Arc. 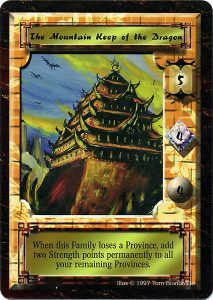 The Dragon were the most mysterious of L5R’s original clans. Mountains, featuring tall peaks and twisting valleys, dominated their lands; easily confusing those not familiar with the region. They remained isolated from most other clans, avoiding conflict throughout much of their early history. Artwork representing the Dragon clan featured their signature mountain ranges, tall imposing towers, or a general motif of isolation from the rest of the world. 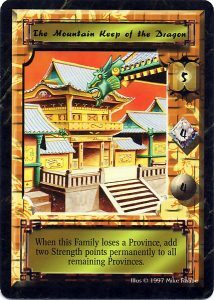 Dragon clan strongholds featured the previously mentioned themes, but would also included dragon statuary, something other clans rarely to emulated with their own signature animals. 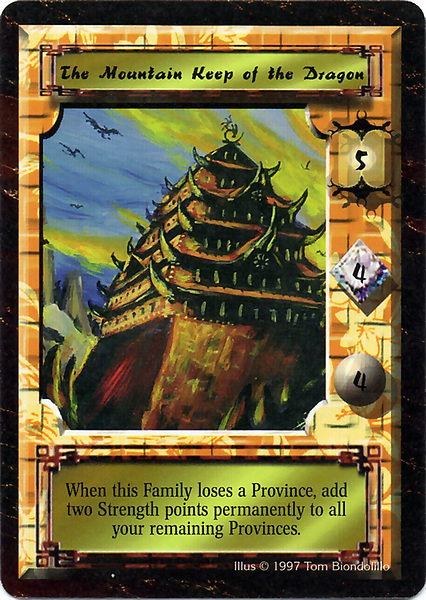 The Emerald Edition version of Mountain Keep, lacked the original’s imposing attributes. 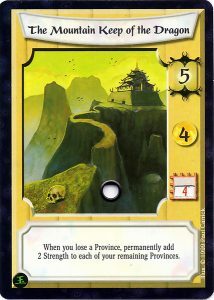 and mountainous terrain that would become hallmarks of Dragon clan strongholds. Instead Mike Raabe painted a more modest sprawling multi-story structure. The vibrant color scheme showed off the clan’s signature gold and green. This version’s protruding statue marked the first appearance of the aforementioned dragon statuary. Time of the Void returned to the more imposing single tower. Tom Biondolillo used a palette of darker golds reminiscent of Wilson’s original Mountain Keep. The perspective leads the eye upwards towards the keep, while the comparatively small birds in the background made the building appear even larger. The keep’s sharp protuberances seemed to defend the building itself from any unwanted guests. Ben Peck’s version of the keep also featured its towering stature. This particular piece emphasized the Dragon clan’s remoteness and isolation. Featuring the structure on a lone plateau with nothing in the surrounding area, but a dark thundering sky harkened back to the haunted house of the original rendition of this stronghold. The roof features the clan’s green color i, while the usual gold takes a more minimal role in some of the detailing. 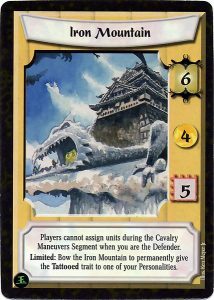 The last Mountain Keep came to us from Paul Carrick, who illustrated another Dragon stronghold prior to this one. Instead of the traditional clan colors, the palette used varying shades of gold and yellow. Carrick’s instructions called for making this particular version look “dilapidated.” This explained the partially destroyed pathway as well as the squat building superseding the previous towers. All these elements suggested departure from an old building past its prime, appropriate for this stronghold’s last printing. The last Dragon stronghold from the Jade arc was Iron Mountain illustrated by Ken Meyer Jr. Your attention is immediately brought to the dragon head serving as the keep’s entrance. The tiny entrance along the cliff edge indicated that reaching this place was no easy task. Like many keeps before, the upwards perspective gave it an imposing look. 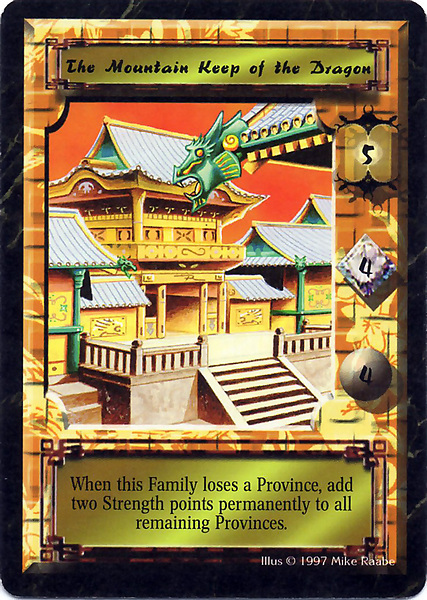 The building itself lacked any of the clan’s colors or signature dragons, instead going for a more traditional look. 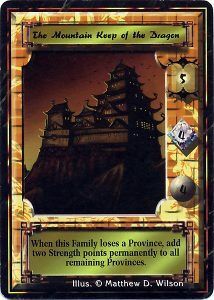 This and the following stronghold are revisited in the game’s later sets. 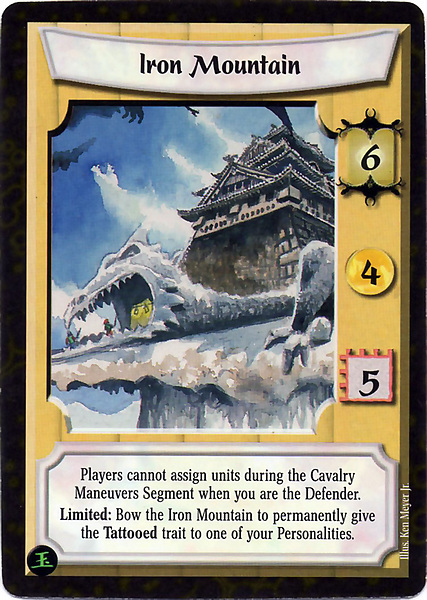 Before climbing the Iron mountain, we would see the only other Dragon stronghold in the Jade arc with Kyuden Hitomi. This stronghold’s appearance gave off more of an Amityville feeling first touched upon with Wilson’s piece. A lone road leading up to the castle’s high walls gives that “keep out” impression that typified this clan. While the structure itself lacked the iconic colors, the picture used an overall green and gold palette. This particular building in the storyline would see a name change later on. It received a new version under that name as well as new art under this name, but those are for another time. That concludes our look back at the Dragon strongholds of the Jade arc. Hopefully you enjoyed the journey through the mysterious lands of the Dragon. Will future iterations of the clan’s strongholds continue these trends? We will just have to find out when we next return to their lands. If you have any suggestions on what future subjects I should cover, please let me know.